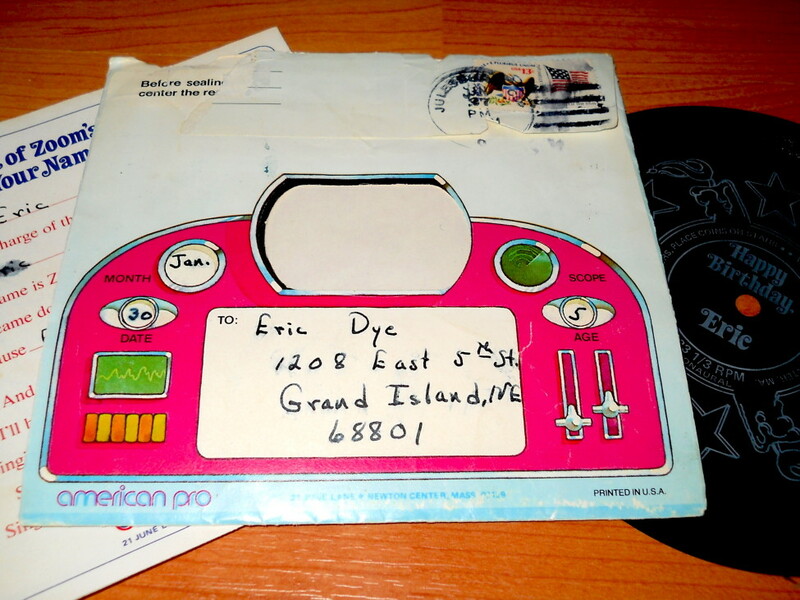 All systems are go for your message to Eric! Hey, Eric! It’s your birthday! Hey, Eric! You’re the big star today! ‘cause Eric, it’s your birthday today! A present for you I wanted to find, an outerspace creature, a one of a kind! Or maybe a 3-eyed tickleshay for your birthday. Well, up on the moon it’s nothing new but that won’t do for you. On your birthday! Singing, Eric! Happy Birthday, to you! Happy Birthday, Eric! See you next year! When you’re five years old, it’s pretty awesome to hear your own name in a song. I remember listening to it every year on my birthday for several years. 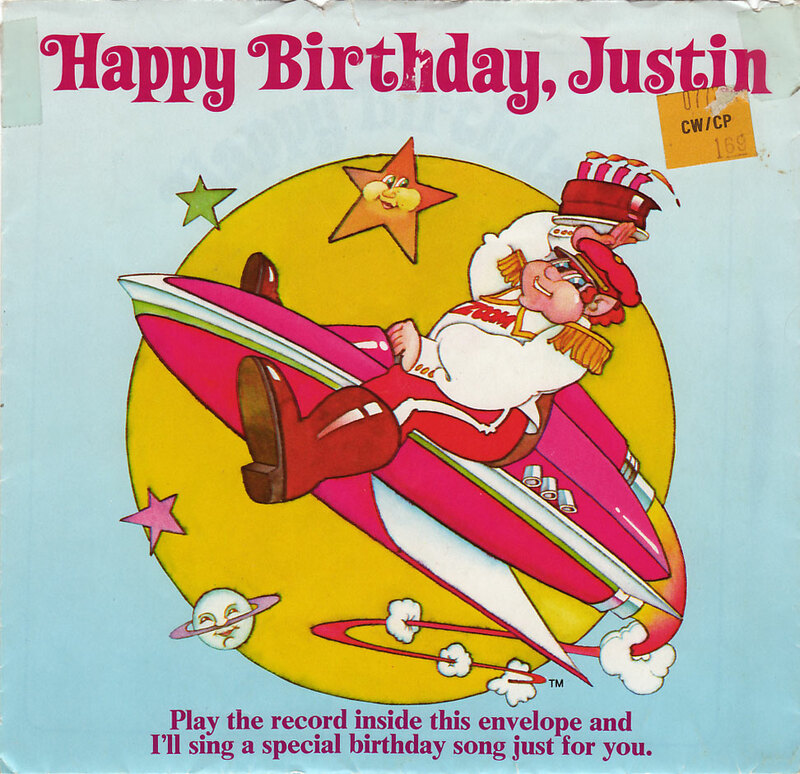 Now, many years later, I find Captain Zoom is still singing the same birthday song! Instead of coming on vinyl, you can purchase a downloadable mp3. Dang. How old did I turn today, anyway!?! From vinyl to mp3—sheesh! Have you ever heard of Captain Zoom? 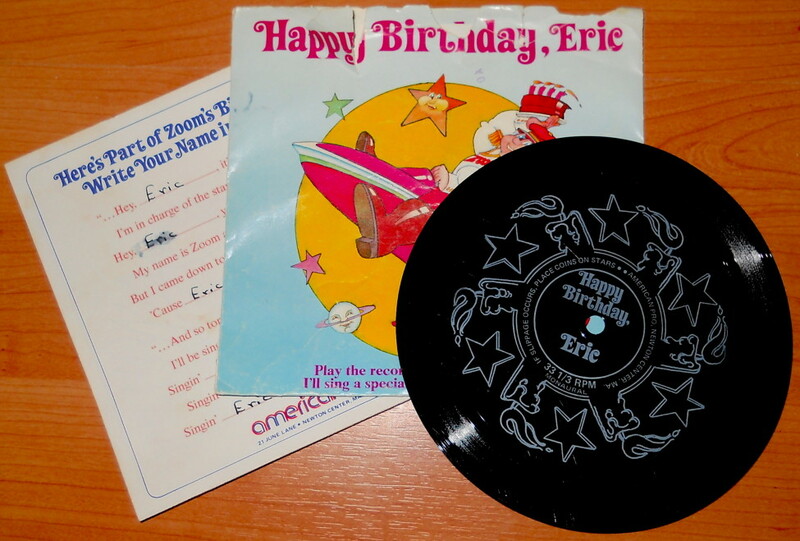 Can you please record your copy of “Happy Birthday Eric” and either put it on YouTube so I can download it, or just email it directly? I’m also named Eric and I had this as a kid too, but due to the thin plastic it’s made from, mine bent and my brother threw it out on me when I was younger. I’ve been searching YouTube and other places looking for a copy I can download for nostalgia, but I’ve not been able to find it. Thank you for this, Eric! My daughter Kate (Katie) turns 43 today. We bought her this record for her birthday when she was about about 4, and she loved it and we played it every year for many years. When she left home we would call her and sing her some version of it that we could remember. 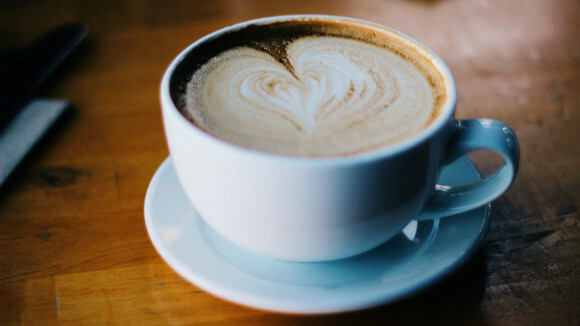 As the years go by, I’ve remembered less of the original words and decided today to check online to see if anyone had posted them–so happy to find your site!! Thanks SO much!! I will call her later and SING and she will love it!! My name is Erik with a “K”. I’m trying to track down a copy of this as my mom bought this for me for my 5th birthday as well. Where did you find this? Where did I find the record? It’s the original from many years ago. I should try to get it converted to mp3…. My name is databits on YouTube (Brad in real life) and I just uploaded Happy Birthday Jackie and Brad. I got my record when I was 16!! I also have “Joshua” to upload. Spread the word!